To measure the indoor or outdoor temperature with the Raspberry Pi, there are several possibilities. This article describes the version with the minimal amount of external components. This is based on the DS18S20 temperature sensor and the software emulation of the 1-wire protocol. The DS18S20 and related DS18B20 and DS1822 are integrated circuits in a TO-92 housing containing the temperature sensor, analog-to-digital converter and 1-wire interface. The types mentioned are pin and software compatible, they differ substantially in the measurement accuracy and price. The three connectors (see picture left) are ground (GND, pin 1), data (DQ pin 2) and operating voltage (VDD, pin3). You can connect VDD and GND and operate the sensor with a parasitic power supply of 3-5 volts. The connection of the circuit with the computer is then possible with a simple two-wire twisted pair cable. At this cable - the 1-wire bus - you may connect several DS1820 parallel. Each sensor has a unique code assigned by the manufacturer to identify itself. Temperature measurement with the Raspberry Pi and the 1-wire temperature sensor DS1820 contains a list of different ways to drive a 1-wire bus from the Raspberry Pi. This paper describes the solution (1) with the least amount of external circuitry. You need apart from the sensors only a single resistor, as this solution completely simulates the 1-wire protocol in software. The data port DQ of the DS1820 is connected directly to the port GPIO4 of the GPIO interface of the Raspberry Pi. GND and VDD are at ground terminal GND. The parasitic power supply accomplished a pull-up resistor of 4k7 between the 3.3 volt connection 3V3 and GPIO4. 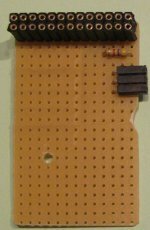 The resistor, a female connector for attachment to the GPIO port and the 1-wire connection is soldered to a small breadboard, which sits directly on the GPIO port. The 1-wire connection can be realized with a space-saving angled female connector. All this fits into the TEK-BERRY housing of the Raspberry Pi. The file consists of two lines, each containing the hexadecimal register-dump of the sensor IC. At the end of the first line is the checksum (CRC) and the information whether it is a valid reading (YES). The second line ends with the temperature reading in thousandths of a degree Celsius. In the example, the temperature is thus 7.375 °C. The accuracy to three places after the decimal point is of course only apparent; the datasheet of DS18S20 states, for example, that the measurement accuracy is only ± 0.5° C. The actual temperature is so anywhere from 6.8 to 7.9° C.
For a long-term recording of temperature readings and comfortable generation of graphics, the use of RRDtool is recommended. The articles Weather data acquisition with the USB WDE1 and Temperature measurement with the Raspberry Pi (USB-serial) explain this tool in detail. The reading of w1_slave is made in the function read_sensor. It tests whether the first line ends with YES and thus there exists a valid checksum. If so, then the function extracts the temperature value from the second line of the file and returns the value in degrees Celsius. In case of error, it returns the value U, which is interpreted as "Unknown" by RRDtool. In the main program are first the definitions of the paths to the temperature sensors - these of course you need to change! Then the script reads in all of the sensors by calling the function read_sensor. The waiting time of one second is to improve the transient response of the parasitic power on the data bus. At the end of the insertion of the measured values into the round robin database is done. The construction of the path to the database assumes that the script and the database are in the same directory. With this definition, the cron daemon executes every five minutes the script, starting with the second minute after the hour. An output redirection sends error messages into the file gettemp.log. Because the database is defined with the smallest measurement interval of 15 minutes, an averaging of three readings takes place. More about "Graphics with RRDtool" and the building a web application for data presentation can be found in the blogs Weather data acquisition with the USB WDE1 and Temperature measurement with the Raspberry Pi. 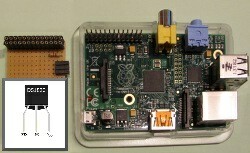 The proposed project implements a temperature measuring station based on the Raspberry Pi with minimal external hardware. The parasitic power supply of the sensors requires only a two-wire cable, but the maximum possible cable length is likely to be limited compared to an active power. If you need to measure temperatures above 70° C, then you should definitely provide an active power supply with a three-wire cable. The GPIO ports on the Raspberry Pi are connected without further buffering with the 1-wire bus. Therefore, the coupling of interference by parallel routed power lines is particularly to be avoided! The solution works for several month reliably with two sensors and a total cable length of about ten meters at my home.